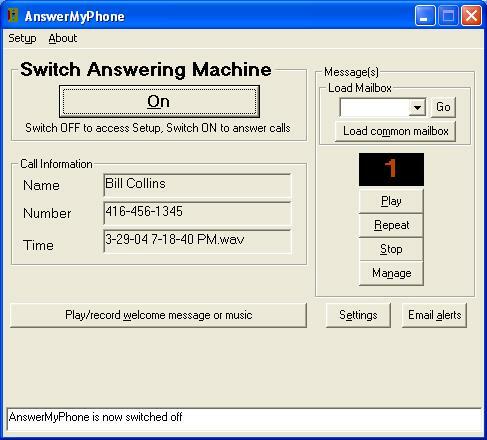 AnswerMyPhone lets you use your PC as an Answering Machine for your telephone with email notification and callerID. It supports multiple voice mail box and creation of interactive voice menu-IVR. Records all incoming calls in real time and stores them as wave files for voicemail access. You can either play recorded messages your multimedia speaker or access them by calling your phone remotely from anywhere in the world with a custom PIN number. ...... Unlike traditional answering machines it can record large number of messages limited only by your harddisk space. Answer Myphone is more flexible and cost effective than traditional answering machines. Records all incoming calls in real time and stores them as wave files for voicemail access. You can either play recorded messages your multimedia speaker or access them by calling your phone remotely from anywhere in the world with a custom PIN number. * Real time recording of all incoming calls with voicemail storage. * Time & Date stamped messages for easy Playback Or Deletion. * Answers Telephone Line Automatically. * Play all recorded messages with a click of a button from your multimedia speaker. * Automatic detection of voice modem/telephony device during first install. * All incoming messages are stored as wave files in a separate MESSAGES Folder. Qweas is providing links to AnswerMyPhone 2.9 as a courtesy, and makes no representations regarding AnswerMyPhone or any other applications or any information related thereto. Any questions, complaints or claims regarding this application AnswerMyPhone 2.9 must be directed to the appropriate software vendor. You may click the publisher link of AnswerMyPhone on the top of this page to get more details about the vendor.